I was so addicted to my mini backpack. It's joined the ranks of overalls in the discussion of things I wore in the 90's that are back but I refuse to wear. Even if it were a mini backpack in leather as cool as yours. I love the 90s! 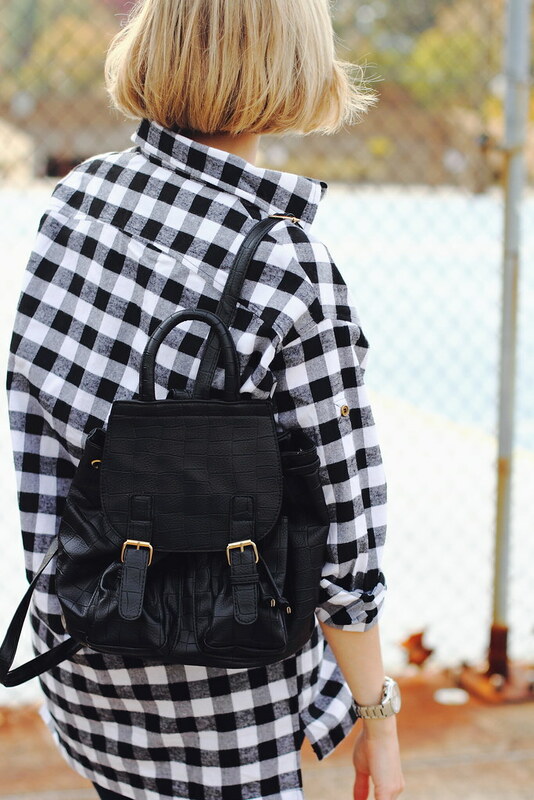 This is such a great look with your backpack and flannel. I love this! Plaid is really the best thing to wear during the fall, and your take on it is no exception. I bought some jelly shoes from BooHoo the other day–so glad to have discovered that site. In love with this classic and edgy look for fall! Those booties are everything! Hi love, great post I love it. Love your style of writing. Keep me updated on new posts plz? Such a cute outfit! Love these jeans! Happy Friday! OMG! This is such an edgy outfit! Love it from head to toe!! That`s a proper 90s look! Love it!